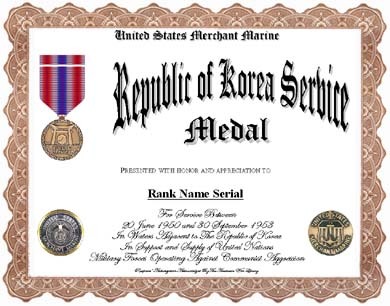 Korean Service Medal, recognizing service in the American merchant marine during the Korean Conflict. It is awarded for service between June 30, 1950, and September 30, 1953, in waters adjacent to Korea. Design: The torii gate and taeguk are traditionally associated with Korea. The ship's chain alludes to maritime service.